I have to admit it, I have always wanted to take an RV vacation. Keeping kosher on vacations in the US is a challenge. The idea that you could bring the “hotel” with you and with a kitchen to boot, always sounded like a great adventure. Unfortunately, I never got the chance. It seems RVs are not as popular in Israel and anyway, you have access to kosher food throughout the country. Time for another true confession - I hate Pesach cleaning. I know, I know, I am not the only one. There are women out there who relish the Spring cleaning aspect of it though. I’ve met them. I don’t understand them. I will do anything to avoid cleaning, especially Pesach cleaning. 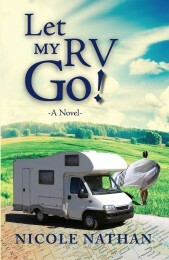 Let My RV Go is a story about journeys. The Berkovitz and Shapiro family travel from frigid Canada to sunny Florida in their RVs. As Baalei Teshuva, they all have been on a spiritual journey and we learn about their pursuits to balance their lives and reconcile their present with their past. Pauline especially struggles to fit in to her new life. Their interactions with each other, and those they meet on their trip, remind us that life is a journey and we all have things to teach one another. A Pesach without scrubbing the house from top to bottom and an RV adventure. This book had great potential from the start. Add to it a light, readable text, humorous anecdotes, and a moving journey, and you have the perfect novel for pre-Pesach craziness. To get the book, see the Facebook page, Barnes and Nobles, or Amazon. Enjoy! I could go on for hours, or days, about the wonderful things that happen in our Yishuv daily. In a crisis, they happen hourly. During our acute crisis, and during Shiva, AM dubbed a particularly delightful habit of certain Yishuv members as Random Acts of Carbohydrates. Hey, we are Jews, if someone is in trouble, pain, sick, healthy, happy...feed them! The sweeter, the better. There is one family in particular that has not given up on us in this practice. The Trips always ask me why. How do you explain chesed on this level? I tell them that we are so lucky that they like us and do nice things for us. But in my heart, it fills a bit of the emptiness that misses the Shabbat flowers or Yom Tov present Trip'n Daddy would sometimes give. You know who you are. I want you to know that your kindness knows no bounds and does wonders for our family's moral.